Okay guys, after much trial with resetting my blogger settings, I think this is the best quality I am going to get out of these photos. I'm sure some of you have noticed I have been absent from blogging for a few months now. To be quite honest, I have put my entire heart and soul into my YouTube channel for the past 6 months and it has been paying off tremendously - thanks for your support! 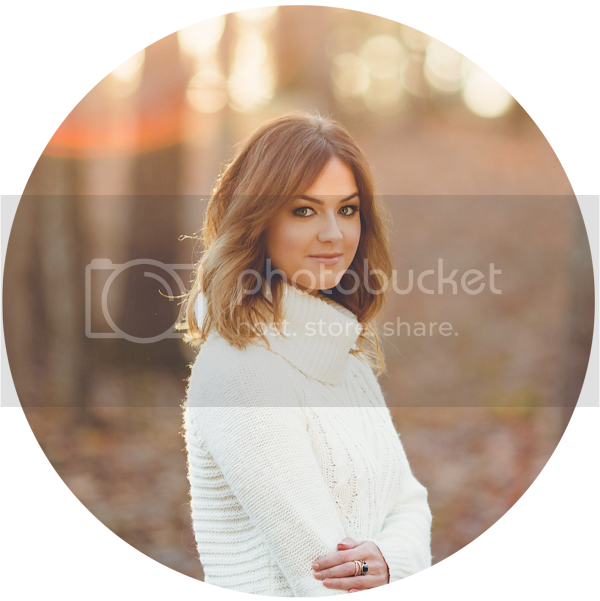 Sooo, I am a little out of the blogging loop right now and when I went to upload these photos last night they were pixelated to the max. 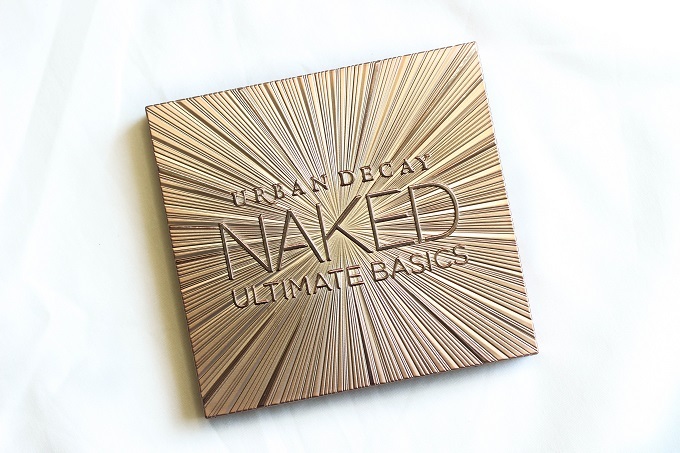 I promised photos and swatches to you all of the Urban Decay Holiday collection but didn't feel comfortable posting the... well ... crappy photos to say the least. However, I think I have made some progress and hopefully you can forgive me for the quality I don't feel is up to par - but, I think it will work to give you guys a sense of the colors and textures. Enjoy! 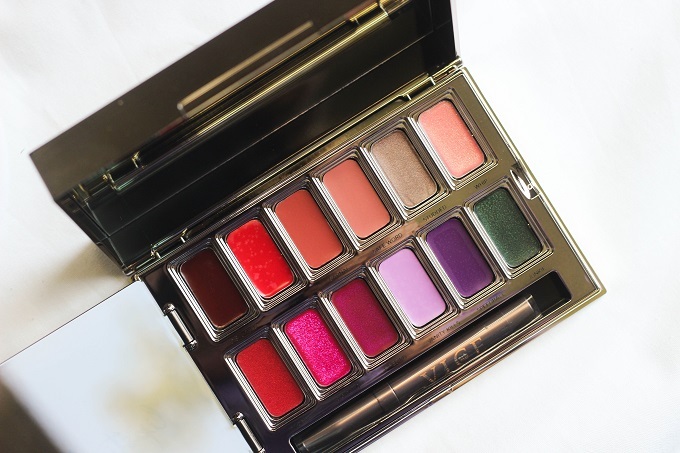 This is a palette I really didn't think I would be too impressed with based upon first glance. 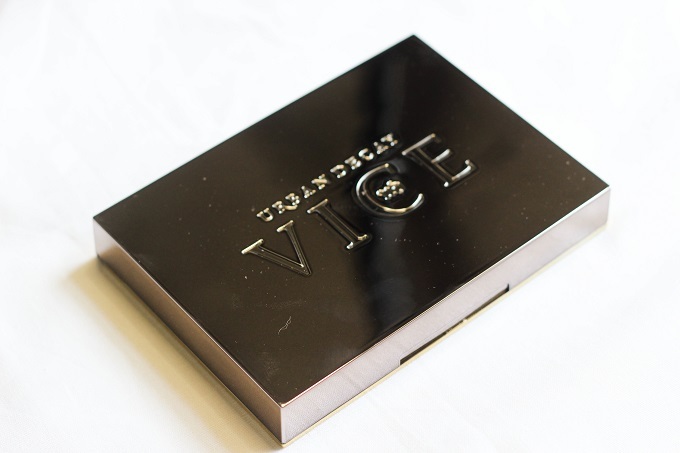 However, I cannot complain a bit about Urban Decay's shadow quality in this palette, it's great and super blendable. 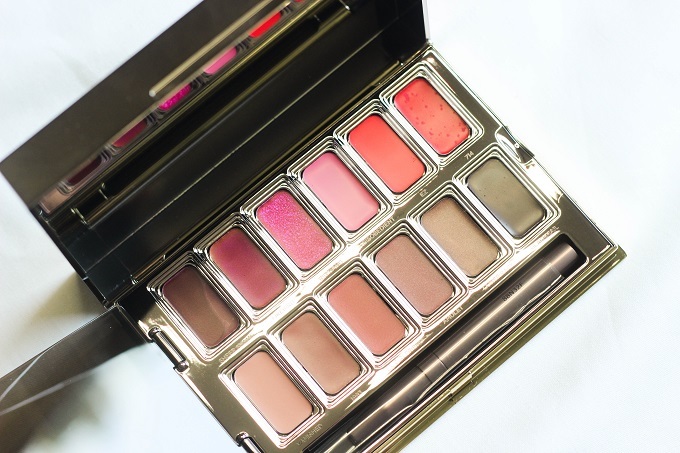 There are many dupable shades if you already own the previous Naked Basics Palettes; such as Blow, Nudie, Blackjack, Pre-Game, and Tempted. 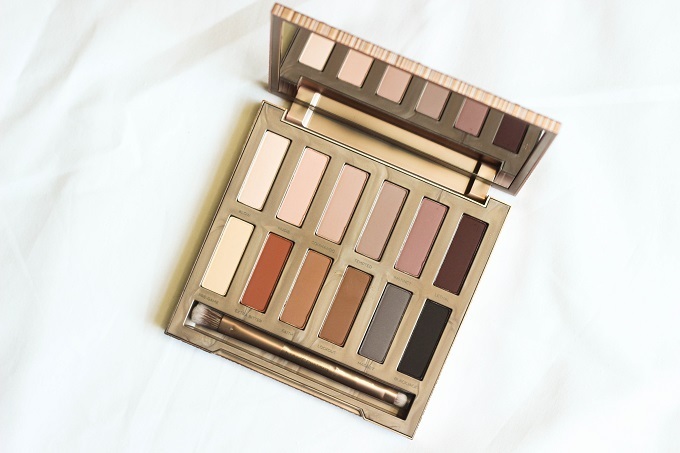 If you already own the Naked Basics 1 and 2, you may not be into this palette like someone who has never owned them before... and I don't blame you. I only own the first Naked basics palette which has probably 4 dupable shades in it (Venus, Foxy, WOS, and Crave). Overall there's about a half and half mixture of cool and warm tones which is nice. The packaging is beautiful and has the most perfect size mirror. It's also a decent size for travel - not too big and not too small. I only see this palette benefitting those who have never purchased Naked Basics 1 and 2 or Urban Decay Palette collectors. The shades are all wearable and amazing quality but you can only have so many matte shades before they all start running together. Upon first glance I thought this palette looked stunning. The shades are unique and seem to be fit for most skin tones. 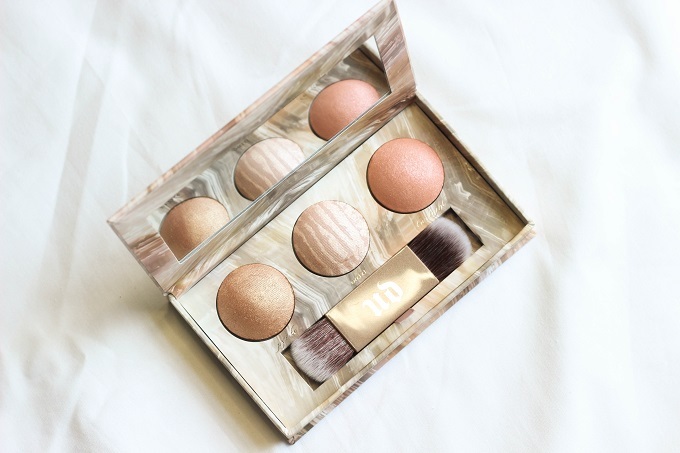 I had never played around with the Urban Decay Illuminators before so I didn't know what to expect. The brush that comes in the palette is also nicer than most that would be included in sets similar to this. I am going to cut straight to the chase...VERY DISAPPOINTING. 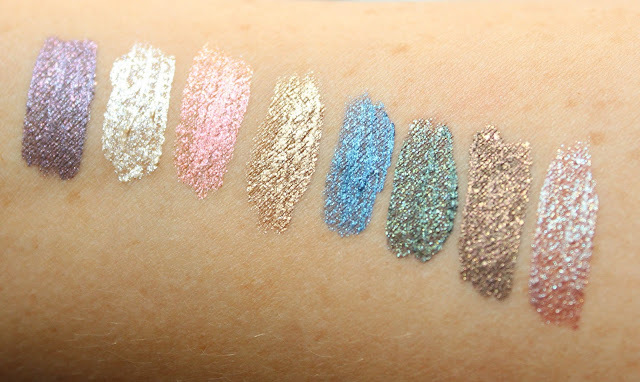 Not only are the illuminators VERY glittery (which I later found out from subscribers seems to be the formula on the traditional UD illuminators too) they had little to no color or highlight payoff. As a matter of fact, I had to spray my arm with MAC Fix+ just to get them to show up in photos for this post. I could not kick the glitter-fest that is these highlighters. Maybe it's just me but something about the hard texture and little to no color pay-off was very unsettling to me. When I went outside in the sun, I looked like I had thrown craft glitter all over my face. I was not a fan. These were two items I was really excited to play with. 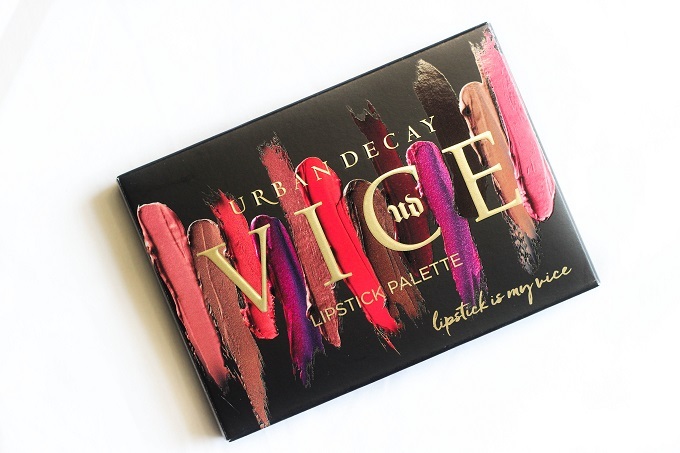 Both palettes contain lipstick shades from the new Urban Decay Vice Lipstick Collection. The packaging is stunning and well made, even down to the lip brush. Shades range from neutral to bold and finishes from matte, sheer, shimmer, sparkle, cream, and more. 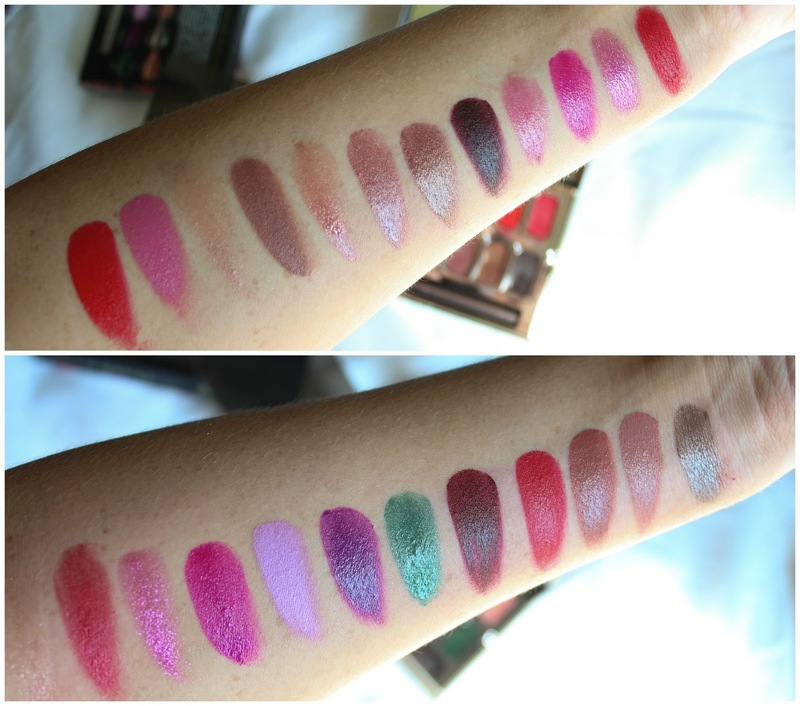 All of the lipsticks swatched well on my lips and arm. The brush is fantastic (definitely not a dinky cosmetic lip brush you would normally get in a lip palette) and retracts once you twist it. Out of the two palettes, neither are technically "neutral". Blackmail would be the more wearable palette in my opinion, whereas Junkie contains a few extra "wild" shades. Some colors are repeats in both palettes such as Firebird, 714, and Big Bang. 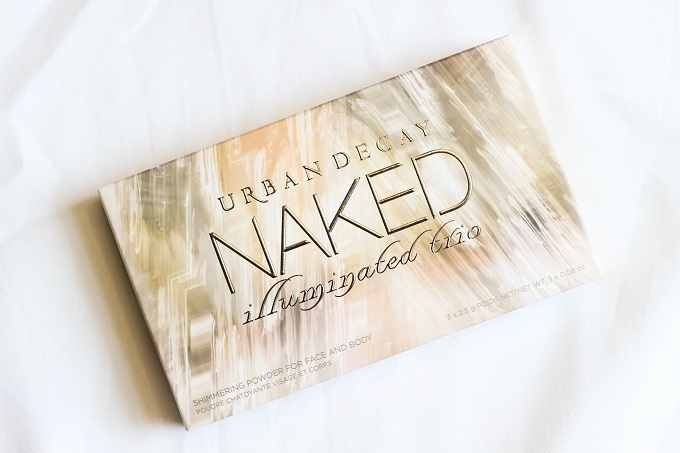 This was a great idea from Urban Decay. I think it gives people a chance to try multiple colors from their lipstick line. I REALLY would have loved to just see a completely neutral palette and a completely bold palette. I think the mixture of both in each palette is really going to throw some people off and keep them from making the plunge. I can see many saying "Man, I love 1993 and Disobedient, but would NEVER wear EZ or Conspiracy. " 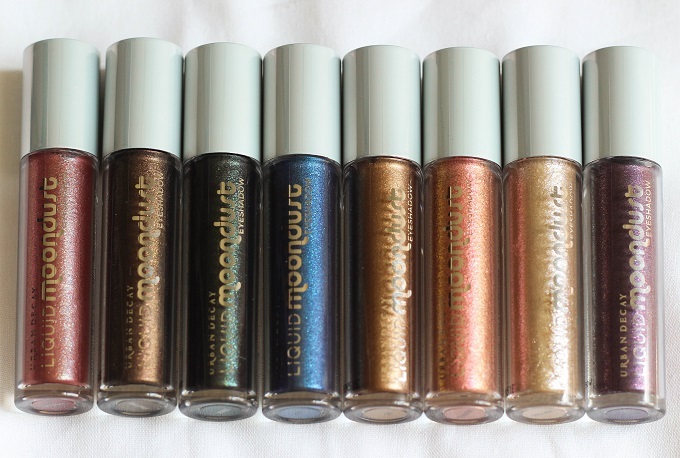 When I initially saw these I thought they would be similar to the current Heavy Metal glitter liners but they are slightly different. These really do remind you of the traditional Urban Decay Moondust shadows, only in a wet formula! 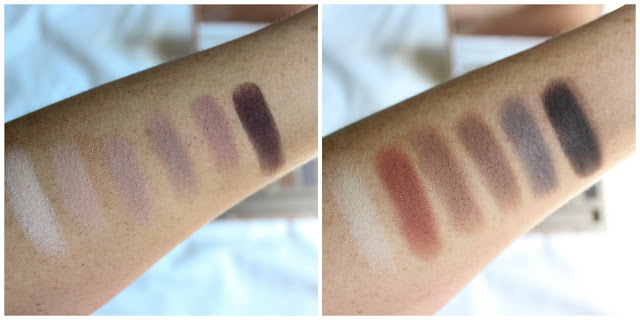 All shades swatched perfectly. When I first swatched them all I had to shake a couple up to get the clear liquid to mix back into the pigment but it wasn't a big deal. I have already used a couple shades and found them to be super easy to apply and long-wearing. There's a nice balance of wearable colors and bold shades too. I was most impressed with these out of the entire collection. They are gorgeous and unique products! Some favorite shades were Chem Trail, Magnetic, Zap, Spacetime, and Solstice. I immediately knew these would not be colors I reached for often. Don't get me wrong, they're super cool, but not every day wearable. 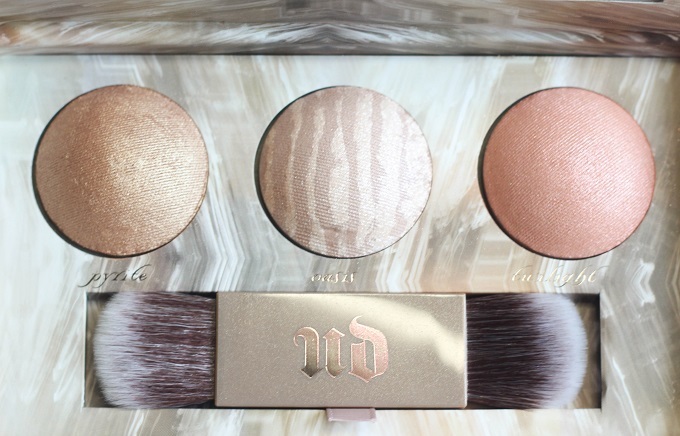 I know Urban Decay wasn't going for that vibe in this collection so I can't complain. 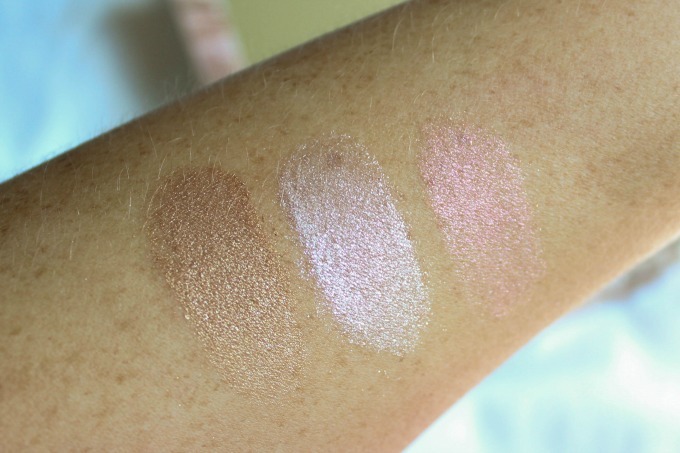 Most shades swatched with a medium shimmery finish. Oil Slick and UV-B swatched the lightest. If you are a bold lip lover, then you will definitely find a shade or two you'll enjoy from this limited collection. I really enjoed Roach and Pallor, I could see myself making them work for a specific look. Alright guys, this is the collection (excluding a few pairs of lashes I didn't get photos of). Again, excuse my "lack of quality" as I figure out what's up with the blog setting and get back into the swing of things. I hope this gave you a better idea about the colors and performance of these products! Feel free to let me know if you have any questions! 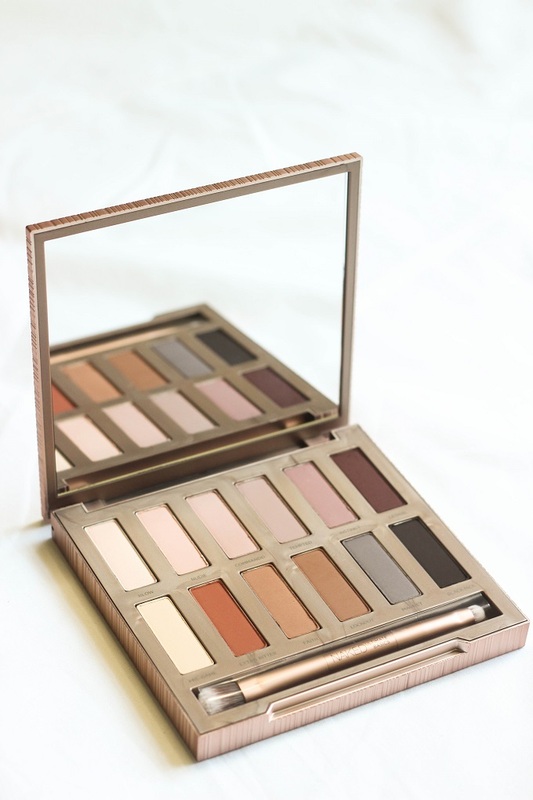 I love the urban decay naked pallets I have had 3 of them, I'm not sure about this one because its all matte, but I will probably try it out lol! Thanks for this review it was really helpful! 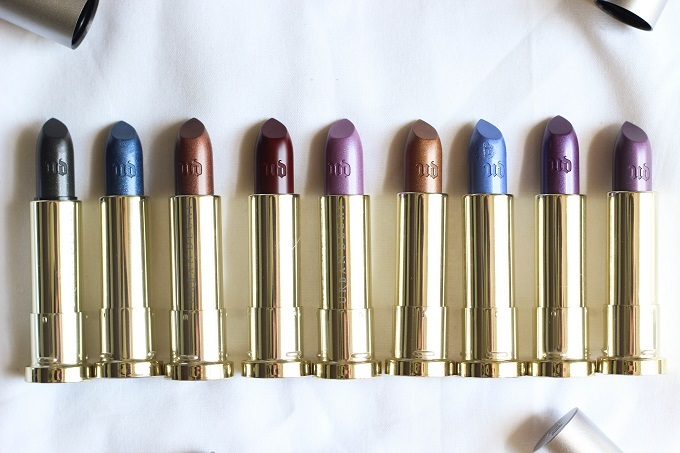 I so love Urban Decay products, especially this 2016 collection where the colors are a perfect choice. A little bit pricey, but definitely worth it! Can't wait to order mine and let my www.trustessays.com/buy-essays-online readers know about it. I really think it will be a sad day when we move on from courtesy and helping each other along the way. But Super Bowl Live Streaming and IMO App Download is something you can try. Thanks a lot for keeping great stuff. I am very much thankful for this site. Friends the next question arise on all of our minds is How to install Candy Crush Saga Download for PC?. Yes, of course, it is true. There is a reason behind this to install IMO for Windows PC. If you are a Mac user, don’t worry download IMO for Mac PC here. Clash of Clans APK ensure that this article gets you the answers to all of your questions. Do you know why WhatsApp became so popular than any other social messenger applications? Because of its simplicity in its user interface. The key to its success. Its user rating is also excellent. IMO reaches this place soon only because of its server response. In my point of view, Showbox Install Android has got such a large video calling facility. Kodi can also download this great IMO app for Windows pc, IMO app for Mac pc. Imo app is the most trending video calling and chatting app by which you can easily stay connected with your friends and family with the low cost of data connection. Google Play Store App is highly used in the European and Gulf countries.This SHAREit App app is particular among the social apps because of its unique features such as user friendliness with a lot of free stickers and high-speed transmission of data. Friends the next question arise on all of our minds is How to install IMO for PC?. Yes, of course, it is true. There is a reason behind this to install IMO for Windows PC.